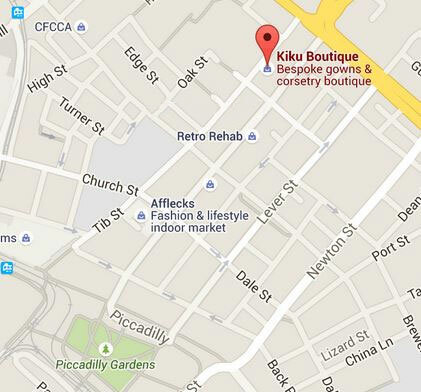 Kiku Boutique; the art of Corsetry, in the heart of Manchester. Burlesque, Lingerie, Wedding & Evening wear! Kiku Boutique offer bespoke corsets, lingerie, headgear and clothing, fully hand fashioned by our own corsetiere, milliner and designers. Located in The Northern Quarter, Manchester, we stock many one-off items ready to wear, and offer made to measure and bespoke services at no added cost. As well as our classic ranges we specialise in limited editions, however we prefer to tailor make a bespoke corset just for you, which can include personalised embroidery and other embellishments. We offer a free measuring and consultation service, so we can create a one off outfit that will be as individual as you are. At Kiku we are passionate about quality fabrics and skilled craftspeople; we have an extensive range of silks and other fabrics for you to choose from. Our aim is to create clothes you will love, with classic lines that are always in fashion. Our bespoke service means that we can design and create a garment that fits you perfectly. Please call into the boutique at 100 Tib Street and talk to Lynn about your requirements. We are just a couple of minutes walk from Piccadilly Gardens, in the heart of The Northern Quarter where you will find a growing range of interesting shops. If you’re looking for that extra special outfit, don't spend hours wandering around other shops. Come and speak to us and we'll endeavour to fulfil your wishes. If you can't make it to the store please call us on 0161 8195031 to discuss your order, or visit our Etsy store to see ready to wear Kiku corsets and other items for sale.